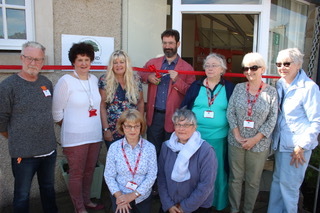 Falkland Community Library was officially opened on the 1st July 2017 by internationally acclaimed Fife author James Oswald. To date it has in excess of 180 registered users, a number which increases on a weekly basis. Come and join us if you have not yet registered. At our library you can borrow books and eBooks for free, use the internet, send emails or connect to our free Wi-Fi. For a small fee you can also print, copy, laminate and/or scan documents. You can meet friends to share a cup of tea, coffee or hot chocolate or simply chat with one of our volunteers. We are located in the free car park directly adjacent to Falkland Community Hall. Falkland Community Library is operated on behalf of the community by Falkland Community Development Trust; a Scottish registered Company Limited by Guarantee (number: 549024) and a registered Scottish Charity (number: SC046949). If you wish to donate to the work of the Trust please do so here. Falkland Community Library is managed by Falkland Community Development Trust. A Charitable Company Limited by Guarantee, Company Number 549024 Scottish Charity Number: SC046949.